At present there is general agreement that the doctrine of the covenants is a peculiarly Reformed doctrine. It emerged in Reformed theology where it was assured of a permanent place and in a way that has also remained confined within these bounds. It is true that towards the end of the seventeenth century this doctrine was taken over by several Lutheran theologians,2 but this apparently took place by way of imitation, the doctrine being unknown within the genuine Lutheran framework. With the Reformed theologians, on the other hand, its emergence occurs in the period of richest development. With full force it lays hold of theological thinking, which in many cases it bends in a distinctive direction. The last-mentioned phenomenon has caused some to be of the opinion that the doctrine of the covenant was something new which did indeed grow up in Reformed soil, but which nevertheless first came to light in Cocceius and his school. Cocceianism and covenant theology would then amount to the same thing. If that is taken to mean that Cocceius was the first to make the covenant idea the dominant concept of his system, then there is some truth to this opinion. Yet even then it cannot be fully agreed with. Cloppenburg and Gellius Snecanus3 had already come up with a covenant theology in the Netherlands, and the same can be said of Olevianus in Germany. What was new in Cocceius was not his covenant theology as such, but rather the historical conclusions for the economy of redemption which he drew from the covenant concept. When these conclusions became apparent, the struggle against Cocceianism was on. If we are looking only for the covenant concept itself, rather than for a covenant theology, we can go back a lot further. Many Reformed theologians had in their systems a locus on the covenant or on the testaments. Trelcatius, father and son, Junius, Gomarus, and others taught the covenant in this sense. With them the concept remained rather subordinate, so that they cannot be called federalists in the later sense of the term. However, it was especially in Germany that the doctrine of the covenant found fruitful soil for development. Not only the Heidelberg theologians but others as well had a special liking for it. This has given rise to the opinion that we are here dealing with an indigenous German phenomenon. The covenant idea is regarded as one of the features of an entirely original trend which some would like to call the German Reformed school. It, in turn, is taken as not having originated in connection with the Swiss Reformation and Calvinism, but rather as being the heir of genuine old German Protestantism as expressed by Melanchthon in the Augustana. It was not Melanchthon who later changed his position or departed from his first principles. It is rather the later Lutheran system that ought to be depicted as an apostasy from the original purity. The German Reformed tradition saved the old Protestant truth from the hands of deteriorated Lutheranism. Thus, the doctrine of the covenant is supposed to be German-Protestant, not Reformed. Or rather, we should not be looking for the genuine Reformed position in Geneva, but with the Germans. Melanchthon, not Calvin, would be the one who took the lead. Heppe was the one who proposed this remarkable historical construction, and has defended it vigorously. If it were true, the covenant concept would have to be regarded with suspicion as a strange intrusion into Reformed territory. Whatever has grown in synergistic soil cannot bear any healthy Reformed fruits. Yet, it need hardly be said how completely untenable this representation is. Heppe himself partly retracted it later. In his Geschichte des Pietismus und der Mystik in der Reformirten Kirche (1879) he admits that the theology of the covenant did not originate with Melanchthon, but rather in Switzerland. It did not arise in Germany but penetrated from the south. It was not the case that the Calvinist stream only later swallowed up the remains of the so-called German Reformed school. Rather, it formed its own bed in Germany very early on and watered its own area with its own freshness. In Switzerland the Reformers had come into direct conflict with the Anabaptists. This external circumstance may have already caused them to appreciate the covenant concept. In their defense of infant baptism they reached for the Old Testament and applied the federal understanding of the sacraments to the new dispensation. Zwingli did this in 1525. In the various catechisms that were published by Leo Judae from 1534 on, the material is strongly penetrated by the covenant idea. The Decades, a series of sermons by Bullinger, saw the light of day between 1549 and 1551, and in 1558 they appeared in German translation under the modified title, The Housebook. This work is structured entirely by the covenant idea. In Calvin, too, mention is frequently made of the covenants. However, his theology was built on the basis of the Trinity, and therefore the covenant concept could not arise as a dominant principle in his case. He is the forerunner of such Reformed theologians who allocate to it a subordinate place as a separate locus. Even his Geneva Catechism, where one would most expect this idea to be elaborated, bypasses it. The theologians of Zürich, on the other hand, are to be regarded as the forerunners of federal theology in the narrower sense insofar as the covenant for them becomes the dominant idea for the practice of the Christian life. Both Olevianus and Ursinus, the well-known Heidelberg theologians, stood in the closest connection to the Zürich theologians. Olevianus had spent time in Zürich, and Ursinus had even been there twice. It is, therefore, obvious that the influence which the covenant concept had on them is to be attributed to this connection. Ursinus applied it in his Larger Catechism.4 We have two works by Olevianus in which the covenant is dealt with, namely, the Interpretation of the Apostolic Symbol and The Substance of the Covenant of Grace between God and the Elect, which saw the light of day in 1576 and 1585, respectively. From that time on federalism did not recede from the Reformed system. It appears in Switzerland with Musculus (1599, Loci Communes), Polanus (Syntagma, 1609), and Wollebius (Compendium, 1625); in Hungary with Szegedin (1585); in Germany with Pierius (1595), Sohnius (Methodus Theologiae), Eglin (1609), and Martinius. In the Netherlands we again find the main ideas of federalism with Junius, Gomarus, both the Trelcatiuses and Nerdenus, until finally with Cloppenburg a workedout system emerges in which the covenant idea is wedded to a strict Calvinism. He is followed by Cocceius. The names of the covenant theologians which follow them are well-known. This overview is sufficient to show how the older writings can manifest the covenant doctrine in Reformed theology. But, one might perhaps say, that only applies to the covenant of grace. These historical data cannot prove that the covenant of works belonged to the old Reformed school. This contention has been expressed repeatedly. In the second half of the seventeenth century Vlak and Bekker declared themselves against the covenant of works on the grounds that it was an invention of the theologians of that period and was not encountered in the older Reformed theologians. It was supposed that Lubbertus, Makkowski, and Cloppenburg were the first to have introduced it. Just as Cocceius has occasionally been looked upon as the discoverer of the covenant concept in general, so also some wanted to maintain that the doctrine of the covenant of works had been thought up in the period immediately preceding Cocceius. If this is taken to mean that previously this doctrine had not been worked out in every detail and was not presented in all clarity as was the case later, then there is some truth to it. But whoever has the historical sense to be able to separate the mature development of a thought from its original sprouting and does not insist that a doctrine be mature at birth, will have no difficulty in recognizing the covenant of works as an old Reformed doctrine. Already with Ursinus in the Larger Catechism the question: "What does the divine law teach you?" is answered: "What kind of a covenant God entered into with man at the creation and how man behaved in the keeping of that covenant,"5 etc. Likewise, Olevianus speaks of the covenant of law, the covenant of nature, the covenant of creation in contradistinction to the covenant of grace. Sometimes, it is true, he means by it the promulgation of the Mosaic law, but in other places it is no less clear that the actual covenant of works has to be sought before the fall. Only in two points was this older doctrine of the covenant of works superseded by its later development. The first concerned the representation principle. The old root-idea of all the descendants of Adam being naturally in their forefather as the ultimate grounds for inherited guilt was still held to. The covenant was entered into with Adam, and because all men were in him it was entered into with all. The later theory did not in the final analysis, and thus not exclusively, appeal to a natural law of life, but to a judicial idea. Secondly, what did not always come to clear expression in the old doctrine was the way in which the covenant of works was to be distinguished from the natural relationship in which man as creature stands to God. Later on these could be kept apart more distinctly. So whenever someone contends for the newness of the covenant of works and thereby means that later there was more light on these two points, then one can agree with him in this. But that does not exhaust the content of the dogma. Its kernel lay deeper. This kernel was already there earlier. Presently we hope to see how intimately this kernel is related to the Reformed principle. Furthermore, we have to make an important restriction which derives from this. There is a phenomenon in the oldest Reformed theology which demonstrates how from the beginning it was based on the recognition of the representation principle and then moved along that line, so to speak. We mean its creationism. The idea of all men being in Adam did not lead Reformed theology astray into swapping this creationism for traducianism. However, if Reformed theology had been completely serious that the fact of all men being naturally in Adam was the ultimate ground for inherited guilt, then it would naturally have come to that position. Natural relationship as the exclusive basis for inherited guilt is inseparable from traducianism. The fact that the Reformed theologians held to the soul's creation by God in spite of all the difficulties, indicates how they here suspected a deeper reason, and instinctively moved in a direction which fits in with the later development of the doctrine of original sin. 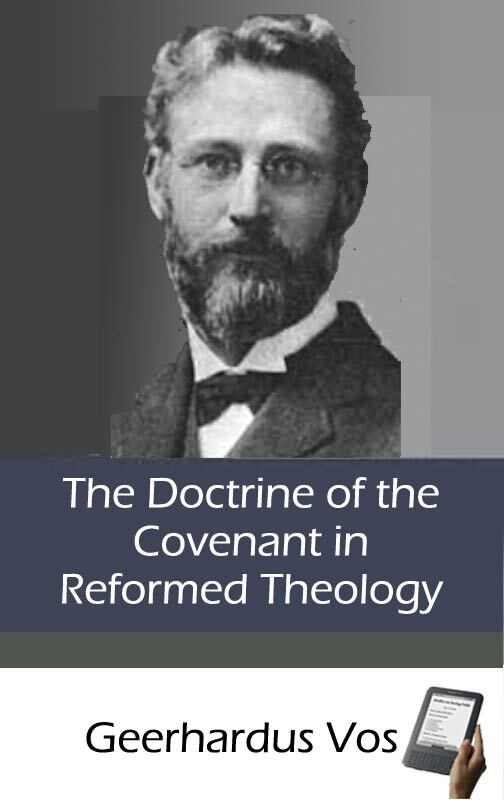 The development of the doctrine of the covenant in English theology deserves special attention. It indicates that federalism is a truly universal phenomenon, emerging everywhere where theology is done on the basis of the Reformed principle. It used to be thought rather generally that British theologians had followed the Dutch on this score. Closer research has speedily shown that it is not a matter of imitation but of independent development. Mitchell, in his work, The Westminster Assembly (Baird Lecture, 1882), says on page 377: "With respect to the doctrine of the Covenants, which some assert to have been derived from Holland, I think myself now, after careful investigation, entitled to maintain that there is nothing taught in the Confession which had not been long before in substance been taught by Rollock and Howie in Scotland, and by Cartwright, Preston, Perkins, Ames and Ball in his two catechisms in England." This is indeed the case. The Westminster Confession is the first Reformed confession in which the doctrine of the covenant is not merely brought in from the side, but is placed in the foreground and has been able to permeate at almost every point. Now the assembly sat from 1643 on. The Summa doctrinae de foedere et testamento of Cocceius did not appear till 1648, and in that year the Westminster Confession had already been completed and seen the light of day. Apparently the Westminster theologians were, therefore, not under any foreign influence, but simply summed up what in their own country had ripened as the fruit of a slow development. In tracing back this development one will have to undoubtedly proceed once again from Bullinger. During the reign of Queen Mary many preachers and scholars had fled to Zürich. Bullinger maintained a lively correspondence with them. The Decades mentioned above were translated into English in 1577 and were afterwards republished several times. In their Latin form they, of course, had an effect much earlier. An English translation of Olevianus' Expositio Symboli Apostolici, as far as we can tell, came from the hand of John Fielde only in 1681.6 However, the conjecture is justified that this book too and the other works of Olevianus were being read in Latin. Here, as elsewhere, they made their contribution to drawing the attention of many to the covenant concept. Robert Rollock was the principal of the University of Edinburgh from 1583 to 1599. His theological lectures were published in part in 1597 with the title, Treatise on Effectual Calling. Appended to this was a Short Catechism concerning the Way in Which God from the Beginning Revealed Both Covenants to the Human Race. An English translation appeared in London in 1603. Rollock proceeds from the idea that all of God's word belongs to a covenant. "God says nothing to man apart from the covenant" The doctrine of the covenant of works is already notably clearer than with Olevianus. "After God had created man in His image, pure and holy, and had written His law in man's heart, He made a covenant with him in which He promised him eternal life on the condition of holy and good works which should answer to the holiness and goodness of the creation, and conform to the law of God. "7 In the covenant of works there is a twofold righteousness—one on which it rests and another which it had to produce. The law has remained as it existed apart from the covenant of works; it has been done away with as a covenant rule. Good works in the first covenant were not strictly meritorious, but were richly rewarded by free favor. One can easily see how the main features have already been drawn here very clearly. We will return to Rollock below. We were unable to peruse Cartwright's treatise, Christian Worship,8 but from other places we know that it took up the thread of the doctrine of the covenant and spun it further. It was published in London in 1616. Not to speak of the many who on occasion made mention of the covenants, an unbroken series of treatises followed since that time which were exclusively concerned with the covenant. The most important up to the time of the Westminster Assembly are the following: The New Covenant or the Inheritance of the Saints, a Treatise about the All-Sufficiency of God, and the Righteousness of Man in the Covenant of Grace, Presented in Fourteen Sermons on Genesis 17:1-2, by John Preston. The first publication of this work appeared in 1629. According to the title, Preston was the king's chaplain and master of Emmanuel College at Cambridge. His work is of a more practical nature. He does not equal Rollock's gift for making fine theological distinctions. This need not be said of Thomas Blake. He wrote a detailed treatise with the title: Vindiciae Foederis, a Treatise about God's Covenant Made with Man, in its Various Types and Degrees. The first publication dates from 1633,9 the second, notably modified and amplified, from 1658. Blake was a clear thinker. He deals with all the thorny questions to which the doctrine of the covenant had given rise and discusses them in a manifold fashion. He develops his own opinion with a consistency which arouses admiration, even where it cannot always be accepted precisely because of this consistency. Because he clearly carries through the doctrine of an external covenant, he occupies a unique position. detected in its formulation of the doctrine of the covenant. Although he did not attend the Assembly, another person who nevertheless had a great influence on the formulation of the Westminster Standards was James Ussher, the archbishop of Armagh, Ireland. In 1615 he wrote the famous Irish Articles, in which the covenant of works and that of grace both appear, the latter being called "the second covenant." The most important sections of these Irish Articles were sometimes incorporated literally into the Westminster Confession. The sequence is also the same. Ussher's Body of Divinity, which he collated from several sources during his youth, made various contributions to the Larger Catechism. This work appeared in London in 1645. In its treatment of the doctrine of the covenant it agrees with the Irish Articles. As to works that appeared on the covenants after the Westminster Assembly, we note Francis Roberts, The Mystery and Marrow of the Bible, i.e. God's Covenants with Man in the First Adam Before the Fall, and in the Last Adam, Jesus Christ, After the Fall (London, 1657). This is a work in small folio of no less than 1721 pages. In Roberts, too, the tendency to stress the development of the economies emerges clearly enough. What he has to say about the covenants in general (although still always detailed enough) takes up much less space than his diffuse doctrine of the various stages. The sequence is the same as with Ball, namely: 1. in Paradise; 2. with Abraham; 3. at Sinai; 4. with David; 5. with Israel in exile; 6. the New Covenant. To what, then, does one attribute the fact that from the beginning this concept of the covenant appears so much in the foreground of Reformed theology? There must be something in its startingpoint by which it feels itself drawn to this idea. One might perhaps say: the question is superfluous. The doctrine of the covenant is taken from the Scriptures. It came with the Reformation's return to the Scriptures, and there is no need for any but this natural explanation. However, such a reply would not at all be satisfactory. The Lutherans as well as the Reformed cast themselves on the Scriptures. Even though we now fully recognize that the latter better than the former succeeded in mastering the rich content of Scripture, this fact in turn also calls for an explanation. Because Reformed theology took hold of the Scriptures in their deepest root idea, it was in a position to work through them more fully from this central point and to let each part of their content come to its own. This root idea which served as the key to unlock the rich treasuries of the Scriptures was the preeminence of God's glory in the consideration of all that has been created. All other explanations of the difference between the Lutheran and the Reformed traditions in the end again come down to this, that the former begins with man and the latter with God. God does not exist because of man, but man because of God. This is what is written at the entrance of the temple of Reformed theology. When this principle is applied to man and his relationship to God, it immediately divides into three parts: 1. All of man's work has to rest on an antecedent work of God; 2. In all of his works man has to show forth God's image and be a means for the revelation of God's virtues; 3. The latter should not occur unconsciously or passively, but the revelation of God's virtues must proceed by way of understanding and will and by way of the conscious life, and actively come to external expression. We hope to show how this threefold demand has been reckoned with precisely in the doctrine of the covenant. Let us now in succession take a look at (1) the covenant of works, (2) the covenant of redemption, and (3) the covenant of grace. (1) When we compare the representations of the original state of man as they have been developed by the different theological traditions, there immediately arises a fundamental difference of great importance for the doctrine of the covenant of works. According to the Lutherans man had already reached his destination in that God had placed him in a state of uprightness. Eternal life was already in his possession. In his situation the highest ideal was realized. Nothing more need be added to execute God's purpose in creating man. Man was mutable, that is true, and he could fall away from the state of original uprightness and bliss. But for the Lutheran conception this is not a stage that points forward to something else, but rather that which was usual and normal and to be expected. From this it follows that the same condition returns in the state of grace to which fallen man is brought by Christ. Precisely because mankind's destination had already been reached before the fall in Adam, Christ can do nothing but restore what was lost in Adam. And since the destination already realized was fully compatible with mutability and the possibility of falling, the sinner who has been brought back to his destination by Christ must necessarily have to remain at this level. Lutheran theology is, therefore, wholly consistent when it teaches an apostasy of the saints. It does not at all object to uniting the state of justification and sonship with the possibility of such an apostasy. It is an entirely different matter with the Pelagians and with all who have Pelagian tendencies. According to them, too, man had been given the highest and most precious at creation, however not in the Lutheran sense of a built-in holiness. The Pelagian will have nothing of the image of God in this sense, whereas on the Lutheran side this is precisely what is stressed as being the image of God to the exclusion of the spiritual capabilities of the soul itself. Yet, according to the Pelagian, it is precisely the lack of this that gives man dignity: he is a free being who has to work himself up out of his moral neutrality and has to attain to holiness by a sort of ethical creative power. He, therefore, already was what he has to be because his destiny is the same as undetermined freedom of choice. Here, too, the same principle carries through to the sphere of grace. What was originally the most important will have to remain the most important in the restoration in Christ. Here it can be seen how there is no room for a real satisfaction. What Christ can do is restricted to the removal of obstacles which hinder man in his exercise of his free will. He once again gives the sinner the opportunity to start from scratch. The Reformed view of the original state of man leads to a totally different result. It was a state of perfect uprightness in which he knew the good and did it consciously. As long as he remained in that state he could also be sure of God's favor. Up to this point the Reformed view concurs with the Lutheran. But whereas the latter can be satisfied by perpetuating such a state and extending it indefinitely, the Reformed view fixes its gaze on something higher. It sees man not as being placed in eternal bliss from the beginning, but as being placed in such a way that he might attain to eternal bliss. There still hovers above him the possibility of sin and death which is given with his mutable freedom. He is free to do the good out of his good nature, but he has not yet attained the highest freedom which can do good only. The latter is placed before him as an ideal. The means of obtaining it is the covenant of works. Here too the state of grace is again ultimately determined by the idea of man's destiny in the state of original uprightness. What we inherit in the second Adam is not restricted to what we lost in the first Adam: it is much rather the full realization of what the first Adam would have achieved for us had he remained unfallen and been confirmed in his state. Someone placed in that state can never again fall from it. As truly as Christ is a perfect Saviour, so truly must he bestow on us the perseverance of the saints. f we now look back on the Reformed principle in its threefold ramification, it is immediately obvious that the covenant of works alone meets its requirements. If with the Pelagian we were to do away with man's increated holiness and allow it to be created by the creature himself, we would deny the requirement that all of man's work must rest on a previous work of God. Here the work of creating the good is taken away from God. If, on the other hand, we were to say with the Lutheran that in his being created man is immediately placed on the highest level of bliss, we would overlook the second requirement, which urges that the life-purpose of the creature be dominated in everything by the honor of God as its higher motivation. The Lutheran viewpoint apparently proceeds from anthropological motives. It is the fatherly side of God's being which is thus revealed, but one does not arrive at a many-sided unfolding of all God's virtues. Even less is the requirement met that the revelation of God's virtues has to be actively and outwardly expressed throughout the conscious life of man. The Reformed representation is different in each of these respects. To begin with we have here the strongest recognition of the antecedent work of God. Man cannot create the good for himself, but he has to develop the divinely given good that lies within him. If his natural goodness is already the creative work of God, the same can be said for the covenantal relationship in which God places him. This too is the product of a free divine deed, a gift flowing out of the condescending mercy of the Lord. Out of the nothingness from which the Almighty called him into being the creature brought along no rights, least of all the right to an unlosable, eternal life. When a way is opened by which he can attain this, then this way is a creation of God, something that, humanly speaking, could have been omitted. This point must be seen clearly. According to the Reformed view the covenant of works is something more than the natural bond which exists between God and man. The Westminster Confession puts this in such a pointedly beautiful way (VII:1): "The distance between God and the creatures is so great, that although reasonable creatures do owe obedience unto Him as their Creator, yet they could never have any fruition of Him as their blessedness and reward, but by some voluntary condescension on God's part, which He hath been pleased to express by way of covenant." Consequently the covenant of works in a striking way meets the second and third requirements mentioned above. In all this covenantal work man displays God's image. Just as the blessedness of God exists in the free relationship of the three Persons of the adorable Being, so man shall also find his blessedness in the covenantal relationship with his God. It is not his bliss in itself, but his salvation as a reflection of the eternal blessedness of God, toward which he is disposed. Therefore, he must not immediately and prematurely possess the highest enjoyment, but be led up to it along a rational way. The image of God within him must be brought out in the full clarity of his consciousness. In a certain sense it must be extended, for in that he can still sin and die man is not God's image bearer. In his life it must be formed by keeping the divine law. With deep moral earnestness he is immediately directed not to his own bliss but to the honor of the Creator, and assigned a task so that, by completing it, he might enter the full joy of his covenant God. (2) If man already stood in a covenant relation to God before the fall, then it is to be expected that the covenant idea will also dominate in the work of redemption. God cannot simply let go of the ordinance which He once instituted, but much rather displays His glory in that He carries it through despite man's sin and apostasy. It was merely the other side of the doctrine of the covenant of works that was seen when the task of the Mediator was also placed in this light. A Pactum Salutis, a Counsel of Peace, a Covenant of Redemption, could then be spoken of. There are two alternatives: one must either deny the covenant arrangement as a general rule for obtaining eternal life, or, granting the latter, he must also regard the gaining of eternal life by the Mediator as a covenant arrangement and place the establishing of a covenant in back of it. Thus it also becomes clear how a denial of the covenant of works sometimes goes hand in hand with a lack of appreciation for the counsel of peace. The covenant of redemption is nothing other than proof for the fact that even the work of redemption, though it springs from God's sovereign will, finds its execution in free deeds performed in a covenantal way. If Christ the Mediator is the object of predestination, He is, as guarantor, equally the freely acting person who desires to do God's will and who, as He comes forth from the glory which He had with the Father, says: "Behold, I come!" Instead of the covenant idea being presented here in a forced way, one must much rather say that only here does it fully come to its own. For it is only in the triune Being that that perfect freedom dominates which the covenant idea appears to demand. Here the covenant is completely two-sided, whereas before the Fall it still had to be regarded as onesided to the extent that man, as God's subordinate, was in duty bound to act upon the covenant that was proposed. Although this covenant of redemption may now be included in God's counsel in that it operates within the Trinity, it should still not be confused with predestination. Theologians well knew how to distinguish the two. They do not take it up under the topic of foreordination, but give it a separate place after that. They may also take it up in the sections dealing with the execution of the decree, so that it follows the teaching on the breaking of the covenant of works and opens the discussion of the covenant of grace, and rightly so. In predestination the divine persons act communally, while economically it is attributed to the Father. In the covenant of redemption they are related to one another judicially. In predestination there is the one, undivided, divine will. In the counsel of peace this will appears as having its own mode of existence in each person. One cannot object to this on the basis of the unity of God's being. To push unity so strongly that the persons can no longer be related to one another judicially would lead to Sabellianism and would undermine the reality of the entire economy of redemption with its person to person relationships. One should consider what Owen brings to bear in removing this objection in his work on the epistle to the Hebrews (Exercitation XXVIII, 1, 13; cf. Brakel, Redelijke Godsdienst, VII, 3). Let us now further consider how the requirement of God's honor is reckoned with in this doctrine of the covenant of redemption. After the fall man will never again be able to work in a manner pleasing to God except a completed work of God be performed on his behalf. Earning eternal life has forever been taken out of his hands. Everything that subjectively happens within him can only be a principle and phenomenon of eternal life itself and in no way a prerequisite for eternal life. The obtaining of eternal life thus comes to lie in God, as a work that is His alone, in which His glory shines and of which nothing, without detracting from that glory, can be attributed to the creature. On this point the entire Reformation, both Lutheran and Calvinist, took exception to Rome, which failed to appreciate this fundamental truth. Yet the reasons which had driven both sides to this protest were different. With Luther it was the thirst for peace and stability for a restless conscience which could find no tranquility in Rome's salvation by works. As long as the sinner himself has to do something for his acquittal, his work remains unstable. Thus the sola fide became the shibboleth of the German Reformation, justification, its principle doctrine. One will agree that, despite all the purity with which this doctrine develops and in which, in developed form, it is given anew to the church, the highest point is still not reached, namely, that point from which the Scripture itself views the matter when, in the words of Paul, it sees the heart of Abraham's faith in his "giving God the glory" (Rom. 4:20). Even in its doctrine of justification Lutheranism did not catch hold of this idea in its fullness. Not a purely theological, but a partly anthropological motif ran through it. It was different with the Reformed. They, too, felt the same necessity to leave the waves of Rome's salvation by works and once again stand on solid ground. But beside and behind this necessity there lay a deeper longing: a thirst for the glory of God that did not primarily meditate on its own peace. When the Reformed takes the obtaining of salvation completely out of man's hands, he does this so that the glory which God gets from it might be uncurtailed. What is important for him is the realization that God glorifies Himself in the salvation of sinners, whereas the Lutheran is satisfied when it merely becomes evident that man brings nothing of his own instability into the picture. For the Reformed the center of gravity does not lie in justification as such, but in the principle by which the latter is to be judged and which the Scripture everywhere applies when it teaches us to regard the work of salvation in its totality as being exclusively a work of God. At this point the Reformed principle and the doctrine of the covenant of redemption are interlocked. The fact that redemption is God's work by which He wills to be glorified can in no wise be more strongly expressed than by thus exposing its emergence from out of the depths of the divine Being Himself. Here it is God who issues the requirement of redemption as God the Father. Again, it is God who for the fulfillment of that requirement becomes the guarantor as God the Son. Once again, it is God to whom belongs the application of redemption as God the Holy Spirit. In the clear light of eternity, where God alone dwells, the economy of salvation is drawn up for us with pure outlines and not darkened by the assistance of any human hand. It is a creation of the triune One from whom, through whom, and to whom are all things. In the dogma of the counsel of peace, then, the doctrine of the covenant has found its genuinely theological rest point. Only when it becomes plain how it is rooted, not in something that did not come into existence until creation, but in God's being itself, only then has this rest point been reached and only then can the covenant idea be thought of theologically. This was also partly apparent in the covenant of works, but it is most distinct here where the order of existence is so beautifully reflected in the order of works, and the persons themselves are involved in a purely divine covenant. When it first emerged, the doctrine of the covenant still betrayed the tendency to proceed from man and to survey its surroundings. By the outworking of the doctrine of the counsel of peace this danger was averted and the center placed in God. Here, too, the requirement was met that the creature in all his relationships should be a means to the revelation of the virtues of God. But the covenant of redemption also has meaning for the application of salvation. It provides the guarantee that the glory of God's works of redemption shall be impressed upon the consciousness of the elect and be actively expressed through their lives. This can happen only when the application of Christ in its entirety occurs because of and in union with Christ. Only when the believer understands how he has to receive and has received everything from the Mediator and how God in no way whatever deals with him except through Christ, only then does a picture of the glorious work that God wrought through Christ emerge in his consciousness and the magnificent idea of grace begin to dominate and to form in his life. For the Reformed, therefore, the entire ordo salutis, beginning with regeneration as its first stage, is bound to the mystical union with Christ. There is no gift that has not been earned by Him. Neither is there a gift that is not bestowed by Him that does not elevate God's glory through His bestowal. Now the basis for this order lies in none other than in the covenant of salvation with Christ. In this covenant those chosen by the Father are given to Christ. In it He became the guarantor so that they would be planted into His body in order to live in the thought-world of grace through faith. As the application of salvation by Christ and by Christ's initiative is a fundamental principle of Reformed theology, this theology has correctly viewed this application as a covenantal requirement which fell to the Mediator and for the fulfilling of which He became the guarantor. In this way Reformed theology simply showed that here too it would be content with nothing but its one all-embracing slogan: the work of grace in the sinner as a mirror for the glory of God. Let us now take another glance at the history of this dogma. Gass held the opinion that the application of the covenant concept to the persons of the Trinity was the only peculiarly new idea that Cocceius introduced into the system. Yet, as in other points, something was here attributed to Cocceius that in reality is much older. In tracing back the development of a doctrine, one should simply take care not to attach too much importance to the name, and because of the lack of later current formulae, to conclude prematurely that it was absent. Stock phrases usually do not appear at the beginning, but only at the end of a development. If we take this into consideration, we will have to agree with Heppe when he, over against Gass's own opinion, points to Olevianus (Geschichte des Pietismus und der Mystik, p. 211). In Olevianus the concept of eternal sponsorship on the part of the Son has already been brought to full and clear expression. In De Substantia Foederis, page 23, he writes: "The Son of God, having been appointed by God as Mediator of the covenant, becomes the guarantor on two counts: 1) He shall satisfy for the sins of all those whom the Father has given him, 2) He shall also bring it to pass that they, being planted in him, shall enjoy freedom in their consciences and from day to day be renewed in the image of God." One should take note that the guaranty of the Son is not merely presented as the prerequisite of the covenant, but as the root of the application and operation of the covenant. With Olevianus this is not an abstract idea, but it dominates his entire presentation. The promise and oath-swearing, by which God gave Himself to us as our God, and the adoption as children of God and heirs of eternal life, were made to Christ, who is the Seed of Abraham, and to all those who are implanted into this Seed (De Subst., p. 2). other way than as the Word to be made flesh, and then in union with the elect, believers, who form his mystical body" (pp. 218f.). In Ames, lecturer at Franeker (after 1622), a Puritan from England, the covenant of redemption is a weapon directed against the Remonstrants. The distinction between the accomplishment and the application of redemption, in the Arminian sense, is rejected by Ames on the following two grounds, among others: 1) that it conceives of God's decision in such a way that it could be frustrated or robbed of its efficacy, 2) that it makes powerless the covenant made with Christ ("He shall see his seed, and the good pleasure of the Lord shall prosper by his hand." Anti-Synodalia. De Morte Christi, I, 5). Thus the covenant of redemption here appears as the higher unity between the accomplishment and application of salvation, alongside the decree. It is especially the English theologians who approach the doctrine from this angle. Preston divides the promises of the covenant of grace into two, and regards the one part as promises made to Christ, the other as promises to believers: It is said, "the promise is made to the Seed," yet the promise is made to us, and yet again the covenant is made with Abraham: How can all these stand together? Answer: The promises that are made to the Seed, that is to Christ himself, are these: Thou shalt be a priest forever; and I will give thee the kingdom of David; thou shalt sit on that throne; thou shalt be a prince of peace, and the government shall be upon thy shoulders; likewise, thou shalt be a prophet to my people. . . . These are the promises that are made to the Seed. The promises that are made to us, though they be of the same covenant, nevertheless differ in this respect: the active part is committed to the Messiah, to the Seed himself, but the passive part consists of the promises made to us: You shall be taught; you shall be made prophets; you shall have your sins forgiven. . . . So the promise is made to us. How is the promise made to Abraham? It reads, "In thee all the nations of the earth shall be blessed." The meaning is that they are derivative promises. The primary and original promises were made to Jesus Christ (Preston, The New Covenant [ed. 1639], pp. 374-5). The same thought is expressed by many others. The motive is the same again and again, namely, to concentrate the application of salvation in Christ, whereby one should naturally always keep in mind that Christ works through the Spirit. Reynolds puts it very beautifully: "Every promise seized upon in faith leads a man to Christ and to the consideration of our union with him. It is only by virtue of this that we partake of the promises, just as lines can be drawn to meet in one center from various points on the circumference of a circle no matter how far apart these be." Even Blake, in spite of his strongly sustained denial of any internal covenant, does not deny the existence of the covenant of redemption. He admits that federal transactions took place between the Father and the Son. He admits too that this happened for our sakes, and finally that the economy of the covenant of grace and our being in it is founded on the covenant of redemption (Vindiciae Foederis, pp. 14f.). The doctrine of the covenant of redemption is worked out in a most precise way by Cloppenburg. In Over het Verbond Gods (Disputationes, III, 4; Opera Omnia, I, 503) he says: "Here there arises before us the twofold diatheke or dispensation of the new covenant (covenant of grace) of which Christ speaks in Luke 22:29. 1) The one which the Father covenantally ordains to the guarantor, 2) The one in which the Son as the Father's guarantor ordains the promise of life and heavenly glory for our sake. As for the first arrangement, the covenant is said to be previously ratified by God in Him, Gal. 3: 17. Here the full covenant concept remains, namely a two-sided agreement of mutual trust. As for the second arrangement, the covenant is called a testament established for us by the dying Testator, Heb. 9:14-17." Cloppenburg then continues by first speaking about the covenant arrangement between God the Father and the Son as guarantor in which we are considered one with the latter. The peculiar thing with him is that he chooses the doctrine of the covenant as a point of departure for his polemic against the Remonstrants.12 From this rapid overview it is apparent that the dogma of the covenant of redemption is something other than a reworking of the doctrine of election. It owes its existence not to a tendency to draw the covenant back and take it up in the decree, but to concentrate it in the Mediator and to demonstrate the unity between the accomplishment and application of salvation in Him, on the one side, and the various stages of the covenant, on the other. From this it follows that much less emphasis than one generally attributes to the theologians is placed on its transcendent eternity and that, despite the fact that it is called eternal, this eternity still has a different character than that of the decrees. It is eternal insofar as it falls within the Trinity, within the divine being that exists in eternity, but not eternal in the sense that it was elevated above the reality of history. "Just as man had committed a double evil," says Olevianus, "so the Son of God, having been made Mediator of the covenant by God, becomes the guarantor on two counts: 1) that he shall satisfy, etc." And Francis Roberts gives this definition: "The covenant of faith is God's gracious compact or agreement with Jesus Christ, the last Adam, and in him with all his seed, after the fall, concerning their recovery out of the state of sin and death into a state of righteousness and eternal life, by Christ; that in him the Lord may be their God, and they His people; that they should accept Christ and these covenanted mercies by true faith and walk worthy of them according to the Gospel" (p. 69). That the covenant of redemption is an innovation is a position already refuted by Witsius in the Huishouding der Verbonden (I, 2, 16) and by Roberts before him (God's Covenants, II, 2, 3). It should never be forgotten that this doctrine also had a history. It was not taken from the Scriptures ready and completed, but grew out of them. The federal theologians after Cocceius sometimes painted too human a picture. It has not always been defended too happily exegetically either. But, as far as its core is concerned, it lies so firmly in the principles of Reformed theology that it has endured every attack and, despite its transcendent character, has assured itself of a permanent place in the minds of believers. (3) If the work of salvation has a covenantal form at its roots, then the rest of its unfolding is bound to correspond to it and proceed in a covenantal way. The covenant of redemption does not stand by itself, but is the basis of the economy of salvation. It is the great prelude which in the Scriptures resounds from eternity on into our own time and in which we can already listen to the pure tones of the psalm of grace. Because God has from the beginning set Himself to give love and faithfulness as a man to his friend, and because by the Son of His good pleasure He has committed Himself covenantally to the restoration of the violated faithfulness, so the application of this covenantal salvation will have to proceed along the same lines. The covenant of redemption is the pattern for the covenant of grace. However, it is more than that. It is also the effective cause for carrying through the latter. As far as its offer and application are concerned, the covenant of grace lies enclosed in the counsel of peace, so that with respect to the latter it appears completely as a gift, as a covenantal benefit. By virtue of His official appointment, His being anointed as Mediator in the covenant of redemption, the Son rules throughout the ages in the house of grace, gathers unto Himself a church through Word and Spirit, and lays claim on all those who desire to live according to His ordinances. However narrowly or widely the boundary of the covenant of grace be drawn, in any case it involves a relationship with Christ, whether external or internal, by which it is tied to the covenant of redemption. Nor may it be thought that the appearance of the Mediator in this covenant, as the guarantor for His own, prevents them from standing in covenantal relationship to God. The Son became guarantor precisely so that they might be presented as parties in the covenant and behave as such, so that there will be no imputation to them of His merits without re-creation in God's image and glorification of God's grace in the mirror of their mind and in the activity of their life. Least of all does it bypass them. Even as the substitutionary role of Adam does not prevent any individual from reacting personally in his own conscience to the breaking of the covenant of works, even so the guaranty of Christ does not prevent any believer from feeling the covenant of grace working out in his own relationship to God. Precisely because it was never intended to place the covenant of grace loosely beside the counsel of peace, one's manner of presentation could largely remain a matter of preference. Although some chose to distribute the data over two covenants and others to include them in one covenant, they always remained aware of the fact that here it was not a question of a difference in principle, but merely of a difference in method. A conclusive example of this is offered by the Westminster Standards. Whereas the Confession speaks of a covenant of grace between God and the believer in Christ, the Larger Catechism presents it as a covenant made with Christ as the second Adam. (a) On the basis of the accomplished work of God the covenantal relation unfolds as the essence of the riches of the ordo salutis. Here once again the working out of the glory of God in the consciousness and life of faith appears at every point to be the leading thought by which the covenant concept is explained. In response to the question how the salvation obtained by the Mediator is appropriated by the individual, the Reformed believer answers: In such a way that it best reveals the greatness and the glory of the triune God in the work of salvation. It is not the case that man immediately and at once comes into possession of full blessedness, for then there would not be an opportunity to see the unfolding of the wonderful plan of grace. Neither is it the case that grace as materia medica is poured into the sinner; for then he would fail to appreciate its divine beauty. The reality of his situation must be revealed in the consciousness of the sinner to whom God shows His grace. Hence, the Reformed Christian loves to express the work of grace in terms of conscious life. He often speaks about a powerful calling, occasionally in the sense of regeneration. He does not deny thereby that an immediate act of God is required to create spiritual life in the dead soul; rather he intends to express as strongly as possible that life first comes to its greatest fruition, its destiny, in the conscious recognition of God's grace. Hence, if the Word as the food for God's conscious working is not present, the work is not God's. It is not difficult to summarize these thoughts in the concept of covenantal relationship. The way in which God deals with man, from the external call on, reveals traces of this concept. It is, as it were, made transparent by the light of moral responsibility. Even the presentation and preaching of salvation is directed towards taking hold of man in the consciousness of his relation to God and towards stimulating his consciousness and making him react freely to the condescending goodness of God, coming to him in the way of covenant. This becomes possible by means of the Reformed distinction between the broader and the narrower sense of the image of God in man. The Lutheran conceives of the image of God as being found mainly in the moral qualities of the soul. According to the Reformed understanding, these two cannot be identified. Man has understanding and will, he is spirit, he can know God; in this regard too, he is the image of God. In the extent that these capacities are present after the fall, he remains in the image of God. The purpose here is not to ascribe any good to fallen man, but rather to present him in the deepest recesses of his being and in his true destiny as somebody who has to take in the glory of God and allow it to shine through him. He who keeps this in mind will also be able to understand why the preaching of the law in relation to the concept of the covenant has a somewhat different significance for Reformed theologians than for Lutherans. The latter scarcely allow a place to the law before the fall. Both before and after regeneration the law has only a negative character, serving to generate repentance and mortification of the old man of sin. For the Reformed it also serves this purpose, but that is not all. Even those among the theologians who strictly separate law and gospel and make the latter to consist wholly of promises—as a matter of fact, those theologians more than others—put emphasis on the fact that the law, as the comprehensive norm for the life of man, also determines man's relation to the gospel. At this point we observe the intensely moral seriousness of the Reformed point of view. Nothing can occur in man's life where God's law does not immediately apply and is not impressed strongly on his conscience. As soon as the gospel enters into the consciousness of man, he is confronted with the demand of faith. There is not a single sinner who for one moment can withdraw himself from that responsibility toward the gospel, to which he is bound by his conscience. Just as man before the fall was obligated to enter into the covenant of works, even so fallen man is obligated to receive grace with a believing heart. Of course, the difference remains that while acceptance was a matter of course in the state of rectitude, it cannot take place in the fallen state except for supernatural grace. There is still another area in which the Reformed view of the law is influenced by the idea of the covenant. Even after the fall, the law retains something of its covenantal form. The law was not included in the federal relationship without having been affected by it. Even today the call of the law sounds in our ears: such a life I would give you, if only you could fulfill me! God could have wholly eradicated that relation and have taken away the last traces of it from our minds, after the covenant of works was broken. However, He kept its memory alive in us. He has repeated that promise hypothetically and consequently has held up before us constantly the ideal of eternal life to be obtained by keeping the law, a lost ideal though it be. Thus the essential content of the concept of covenant has been kept in our consciousness. When the work of the Spirit by means of the law and the gospel leads to true conversion, in this conversion the longing for this lost ideal of the covenant appears as an essential part. From the above we can also explain why the older theologians did not always clearly distinguish between the covenant of works and the Sinaitic covenant. At Sinai it was not the "bare" law that was given, but a reflection of the covenant of works revived, as it were, in the interests of the covenant of grace continued at Sinai.13 (b) It would be a mistake, however, to say that the above is the essence of the covenant. That natural relation in which man stands to God and this just claim made by the Creator, remain valid, also at each later stage and are presupposed in each act, including the covenant of grace. Only let no one suppose that the covenant of grace can ever be exhausted by these factors and can involve nothing more than them. Its essence, that by which it becomes a power for everyday life, lies in an additional factor which we now need to bring into view. For the proper appreciation of its character we first refer to the following feature. Covenant theology was accustomed to survey the truth from the perspective of the Christian life. That does not mean that it remained within the boundaries of a limited soteriology, for it was too Reformed to do that; its purpose truly was the glory of God. While at times the personal interest in the teaching of truth was pushed aside for objectivity's sake, the unity of Christian and theologian comes to expression in the federalist. This comes out, as is well known, in the Heidelberg Catechism, in which the believing I continually expresses himself. From this it is clear that the concept of covenant was considered as having been realized only in the believing Christian. Only rarely is the problem taken up as to how to consider those who lack faith and yet live under the ministry of the covenant. Covenant theology develops its contents not by placing itself before and thus outside it, but in the middle of the covenant. The covenant is neither a hypothetical relationship, nor a conditional position; rather it is the fresh, living fellowship in which the power of grace is operative. Only by the exercise of faith does it become a reality. It is always believers who act as true covenant partners with God. They who are partners also have the promises in their entirety sealed to them as believers. The covenant is a totality from which no benefit can be excluded. If this is indeed an essential feature of the covenantal outlook, it follows that this outlook cannot function apart from the idea of election. The origin of the grace of God, the full benefits of which the Reformed believer enjoys by the covenant, always lies for him in election. If consciousness of the covenant is the right expression for the consciousness of faith in its Reformed form, then there must not only be a place in it for the idea of election, but it must be permeated by that idea. Otherwise its deepest, most beautiful and precious fragrance would be lacking. We find, then, that the bloodstream of electing grace runs throughout the Christian life, even as the doctrine of the covenant pictures that life in its true freshness. At the most, one could say that it less sharply delineates the darker side of this doctrine, reprobation, because of its practical treatment of election. Yet, Reformed theology has not doubted or denied it. As for the other side, we may say that the consciousness of the covenant and consciousness of election are not divorced, and that the former is the basis of the latter. The following provides sufficient proof: It is a historical fact that the concept of the covenant lives in the consciousness of believers to express the certainty of the state of grace. It was used as a formula for the doctrine of the perseverance of the saints, a doctrine undoubtedly rooted in election. The train of thought was as follows: The fixity of the covenant of works depended on both God and man. Therefore, it was a temporal, uncertain covenant. The covenant of grace has its fixity in God alone, who answers for both parties, and effects man's willing and working by the Holy Spirit. Its fixity does not lie at the end as an ideal to be reached, but in the beginning, in the work of the Mediator, which in turn is already grounded in His eternal guaranty. Hence, it is an unalterable covenant, which extends into eternity. It is an announcement of intended marriage by which the believer is assured of his future. Now one could say: that is only meant from God's perspective and must be understood in such a way that He keeps and will keep His conditional promise forever. But this is impossible simply because of the fact that there would be no foundation for the perseverance of the saints, and because such a fixity can never be ascribed to the covenant of grace in distinction to the covenant of works. We should not forget that the reaction of the Calvinistic Reformation against the Lutheran doctrine had to favor this usage of the idea of the covenant. If salvation is localized for me externally in the means of grace, then also the continuation and development of grace in me will depend on the use of the external means. Therefore the Lutheran is unacquainted with the perseverance of the saints, and is satisfied with the continual presence of the means of grace. He believes in a perseverance of the means of grace, as has been very strikingly observed. But when the concept of the covenant is placed in back of the means of grace, so that grace lies in God's hand and not in something created, then grace must immediately assume an irresistible and imperishable character. (c) As far as adults are concerned—since we are discussing them for the present—the covenant presupposes acceptance and personal appropriation of its contents by faith on the basis of the electing grace of God, and the administration of the covenant starts from this presumption. This is the third and new aspect, which is added to the offer of the covenant and the requirement to enter into the covenant. Here its realization takes place. It is perhaps not superfluous to cite some well-known theologians in their own words in regard to this subject. First, the actualization of the covenant through saving faith. Bullinger says (Decades, III, 6): "In Genesis we are taught expressly who the parties in the covenant are, viz., the living, eternal, almighty God . . . and Abraham with all his seed, that is with all believers. . . . For the apostle Paul explains the seed of Abraham in this way, particularly in his epistle to the Galatians, where he writes, 'If you are of Christ, then you are Abraham's seed and heirs according to the promise.' " Olevianus extensively argues that the sealing of the covenant is not general, but always starts from the presupposition of the presence of faith. "Therefore one has in the preaching of the Word an offer of the promise of grace and a summons to embrace it; both are directed in this way to the elect as well as to the reprobate. But only in the elect does God work what He commands. In order that out of that entire multitude a church might appear, united by God Himself in Christ, God begins that solemn negotiation, as in a marriage compact, not with a sealing of grace offered, in general (for many reject it openly so that it cannot be sealed to them; and moreover the Lord does not desire to enter into covenant with the hypocrites, who secretly harden themselves, as would be the case if He Himself were first to affix the seal). Rather in the foundation by visible signs, He begins with what was last in the offer of grace, namely, so that we may subject ourselves with our seed and not harden our hearts to the divine command by which He summons us to receive the offered grace. Then follows the sealing of the grace first offered in the gospel and also the special bond of God" (Substantia Foederis, II, 54). Peter Martyr takes the same position. We read: "Faith always has to precede the use of the sacraments, if we want to use them correctly and not reverse the order. Even as one eats and drinks without faith in an unworthy manner, so baptism without faith is also received in an unworthy manner. I want this to be understood with reference to adults, for the precise situation of children, we deal with elsewhere" (Loci Communes, II, 16, 10). Musculus distinguishes the general covenant made by God with the whole earth and its inhabitants, animals as well as men, from "the special and eternal covenant, which He deigned to make with the elect and believers. This covenant is called 'special' because it is not relevant to all, but only to those who are elect and believers, viz., to Abraham as the father of believers and his seed" (Loci Communes, p. 142). Polanus teaches: "The covenant common to all believers is made with every believer in particular in baptism" (Syntagma, VI, 33). Preston writes: "The next question is how can any one know whether he is in the covenant or not? . . . If you believe, it is certain that you are in the covenant. . . . And there is still another way to know this, viz., 'In your seed all the generations of the earth will be blessed.' When one is planted in this Seed, he will be blessed" (The New Covenant, pp. 378, 380). Only Blake makes an exception to this. He considers the essence of the covenant to lie in historical faith and explains that this entitles one to baptism—in the case of an adult, and that only the promise of future saving faith has to be included, without presupposing the presence of the latter (Vindicae Foederis, p. 289). It is equally easy to demonstrate that the theologians did not place election and covenant side by side in a dualistic fashion, but related them organically. It is a well-known fact that for many election circumscribes the extent of the covenant even in their definition of the covenant. This is the case with Witsius, Braun, Lampe, Maestricht, á Marck, Brakel, Francken and others. One finds this description not only in the later theologians; it is found just as well in the very earliest. Olevianus' work is entitled: "Concerning the Substance of the Covenant of Grace Between God and the elect." Szegedin speaks of a "special and eternal covenant, which God Himself deigned to make with the believers and elect" (cited by Heppe, Geschichte des Pietismus und der Mystik in der Reformirten Kirche, p. 208). Musculus expressed himself identically, as one can see above. Polanus is no different: "God made both covenants (old and new) only with the elect" (Syntagma, VI, 33). Again, in 1603 Martinius, professor in Bremen, who later advocated a more liberal outlook at Dordrecht, wrote about "the covenant of grace with certain individual-elect, to whose number I belong." One hardly needs to be reminded how all this in no sense means that covenant administration proceeds from election, nor that all nonelect stand outside any relation to the administration of the covenant. Rather it means: 1) that any certainty about one's election must develop out of a strong covenant awareness; 2) that throughout the entire administration of the covenant the all-embracing promises of God, as they result from election, must be kept in mind, both in word and sacrament; 3) that finally the essence of the covenant, its full realization, is found only in the true children of God, and therefore is no more extensive than election. Especially the second point is important. Besides the fact that everywhere God's covenant is administered, there is a sealing of its content: the presence of faith is the presupposition of the assurance that one is entitled to the blessings of the covenant—besides this fact, we say, there is always a solemn witness and sealing of the fact that God wishes to realize in all the elect the total scope of the covenant. These two aspects are very clearly distinguished in the definition of the Westminster Confession on the covenant of grace: ". . . the Covenant of Grace; wherein He freely offereth unto sinners life and salvation by Jesus Christ; requiring of them faith in Him, that they may be saved, and promising to give unto all those that are ordained unto eternal life His Holy Spirit, to make them willing, and able to believe" (VII, 3). Having seen how the doctrine of the covenant of grace does full justice to the demand of the glorification of God in the conscience of believers, we may go on to point out the influence of this same doctrine on the active life of the believer. Faith, considered from the aspect of the covenant, is not only wider in outlook and more comprehensive, it is also more powerful and healthy than elsewhere, for it carries with it the basis of good works. There is a covenantal obligation in the state of grace. The new life obtained by Christ must be brought to action and development by having the stimulus of gratitude work on the renewed moral consciousness. This is the opposite of what was expected from the strong emphasis on predestination. No passivity is preached, rather a strict discipline is required, which sometimes goes so far as to make the Lutherans fear a return to the Roman doctrine of salvation by works. That fear is unfounded. It is Christ, the Mediator, working in His members, who brings these sacrifices of gratitude. In the words of our Catechism, it is impossible that someone, having been united to Christ, would not produce fruits of gratitude. Christ must rule gloriously in His people, for that is the reward of His labor. He cannot be quiet and inactive in us. His kingdom is only fully manifest when we are so governed by His Word and Spirit that we are wholly subject to Him. Christ is the anointed King, not only over His church, but also He has been given to her as Head over all things. Hence, in the activity of believers, by which His rule is realized, lies also the urgency to work in all spheres of life. For the Reformed believer Christianity, by virtue of its covenantal character, is a restless, recreating principle which never withdraws itself from the world, but seeks to conquer it for Christ. Only out of this consciousness of the covenant comes a true zeal for missions, for in missions the body of Christ is striving toward its own completion, which it cannot reach as long as all its members have not been added. Wherever this thought is lacking, zeal for missions is exclusively fed by philanthropic motives which, by the nature of the case, are less enduring and powerful. Finally, we want to disclose the close connection between the Reformed principle and the doctrine of the covenant from one other important angle. This concerns the historical progress of the church. The Reformation was united in seeking the essence of the church in the invisible, in union with Christ, and not in an external, visible bond, as Rome does. This invisible character is at the same time what is individual, non-transferable. Thus, arises the danger that continuity is lost. In order to check this danger Luther moved a long way back to Rome. In a certain sense he again imprisoned the supernatural, invisible grace which maintains the church within something external. The power of grace is in the Word and in the sacraments. Where the church is found with the ministry of the Word and sacraments, it is self-sustaining. God, as it were, has let go of the grace which sustains the church and placed it in the means of grace. The Reformed believer cannot be satisfied with this presentation. Certainly he believes in the continuity of the church, but he believes in it and therefore does not need to support it by instruments of salvation, into which grace is poured. For him that continuity is assured by the faithful promise of God. Hence, in back of Word and sacrament he places the covenant as the strongest expression of how the unbroken work of grace from generation to generation rests, as all grace, on the sovereign pleasure of God. The church does not abide because we baptize or work regeneration by baptism; rather because God establishes His covenant from generation to generation, therefore the church remains and we baptize. Since it is God's Covenant and not man's, it is appropriate for the Christian to recognize this goodness of God in quiet gratitude and in faith and to be strengthened by its sealing. Here again the concept of the covenant requires that faith will react freely and actively to this pronouncement of God. The same thing holds true for the covenant as it binds generations together, as holds true for the covenant as it binds the individual to God. The other side of the promise is an appreciative faith. That faith must also live in the church in regard to its continuation in the generations to follow. It must not be like the desert, which does not respond when blessings come upon it; rather, it must be as a watered garden, whose flowers seek the face of the sun and whose leaves unfold to catch the drops of God's rain of grace. It is evident how strongly the idea of the covenant makes itself felt here, and how it elevates itself above all idolatrous worship of the sacraments. In this connection it may also be noted that the idea of the covenant has prevented too narrow a view of the sacraments. Viewed as seals of the covenant, the sacraments possess just as universal and comprehensive significance as the covenant itself. They cease being signs of a particular grace and become what they should be: particular signs of an all-comprehensive grace. They seal Christ to us, the rich and full Christ, with all that we have in Him. We cannot limit that sealing power to any single stage of the way of salvation. Not regeneration, nor justification, nor the communion of the saints, each in itself, but all of these, as they together constitute the blessings of the covenant, are the object of sealing. If the consciousness of the covenant reflects like a mirror the glory of God, then all the separate rays come together in the sacraments, as a focal point, to one glory. (d) With respect to children no less than for adults, it is clear from the above that besides the two elements of the offer of the covenant and the obligation of the covenant, there is still a third element present. This consists of the expectation that covenant children will enter into the fellowship of the covenant. This expectation is based on the promise of God to believers that He desires to be their God and the God of their seed and that He also desires to continue His covenant in their seed and to make it a living reality. This does not merely hold true for some promises under certain restrictions, but also for the promises of the covenant, as they span all of life and include every gift of grace. It is, we think, striking how strongly just in this respect the comprehensive character of the covenant is applied by Reformed churches. All of them assume it to be a totality and do not hesitate to unfold it in all its fullness in their liturgical writings. As a promissory covenant its total content is brought into contact with the individual already as an infant. When that infant later enters into covenantal consciousness by active faith, this faith sums up all that is included in the covenant, so that the wide, rich world of God's works of grace is opened up to his sight, a perspective looking backwards and forward. It is just this beautiful outlook which leads one to call the idea of the covenant of grace a "mother-idea." The covenant is a mother because it spiritually bears sons and daughters by the power of divine grace and the promises, a mother because its children have received everything from it, because it has given birth to them, sustains them, feeds, and blesses them. Reformed theology has certainly realized that the church has two sides, and that besides being the assembly of believers and the revelation of the body of Christ, she must also be the means by which new believers are added. But it has not separated these two sides; rather it has kept them in organic connection. Just because the promises of God have been given to the assembly of believers, in its entirety, including their seed, this assembly is also a mother who conceives sons and daughters and is made to rejoice in her children by the Lord. The name "mother" signifies this truly Reformed point of view in distinction from other terms such as "institution of salvation." As far as we can discover, the leading spokesmen of Reformed theology are completely agreed on this. They all recognize that the church has received such promises for her offspring. They equally recognize that the consideration of these promises is the heart of the fruit of comfort which her view of the covenant offers. And they insist that remembrance of the promise must function as an urgent reason for rousing the seed of the church to embrace the covenant in faith. On both sides, parents and children, this conviction provides strength. Strength was provided in the days of old, in the golden age of the churches, a glorious comfort, finding its most beautiful fruition in the doctrine of the salvation of the children of covenant who die in infancy. Only in the working out of these principles did the theologians diverge to a greater or lesser degree. One could not but expect that a conscious appropriation, an entering into the relation of the covenant by faith and conversion, would be revealed in each member of the covenant who comes to the age of responsibility. The whole tendency of the doctrine of the covenant, as we have tried to present it, led to that demand. One could hardly be satisfied with the thought that a non-rejection of the covenant, where all expression of life was missing, would be sufficient. Here they collided with the discovery, as they also knew from the Scriptures, that not all belong to the seed of the promise. In comparing the statements of theologians at this point, it is clear that the older theologians generally proceeded more fearlessly than the later ones in the individualization and general application of the promises. Beza writes: "The situation of children who are born of believing parents is a special one. They do not have in themselves that quality of faith which is in the adult believer. Yet it cannot be the case that those who have been sanctified by birth and have been separated from the children of unbelievers, do not have the seed and germ of faith. The promise, accepted by the parents in faith, also includes their children to a thousand generations. . . . If it is objected that not all of them who are born of believing parents are elect, seeing that God did not choose all the children of Abraham and Isaac, we do not lack an answer. Though we do not deny that this is the case, still we say that this hidden judgment must be left to God and that normally, by virtue of the promise, all who have been born of believing parents, or if one of the parents believes, are sanctified (Confessio Christianae Fidei, IV, 48). In general Martyr agrees with him: "We do not ascribe this (the enjoyment of the benefits of the covenant) to birth in the flesh as the principle and true cause, for our children's salvation is only by the election and mercy of God, which often accompanies natural birth. . . . This is not out of necessity, for the promise is not generally applicable to the whole seed but only to that seed in which election converges. . . . But because we must not curiously investigate the hidden providence and election of God, we assume that the children of believers are holy, as long as in growing up they do not demonstrate themselves to be estranged from Christ. We do not exclude them from the church, but accept them as members, with the hope that they are partakers of the divine election and have the grace and Spirit of Christ, even as they are the seed of saints. On that basis we baptize them. We do not need to respond to those who object and ask whether the minister is deceived, whether perhaps the infant is in truth no child of the promise, of divine election and mercy. Similar diatribes could be adduced with regard to adults, for we do not know whether they come deceptively, whether they truly believe, whether they are children of election or perdition, etc." (Loci Communes, IV, 8, 7). The children of believers must be baptized, according to Polanus, "because they have been purchased by the blood of Christ, have been washed from their sins, and possess therefore by the work of the Holy Spirit the thing signified. . . . Because the Holy Spirit is promised to them, they possess the Holy Spirit" (Syntagma, VI, 55). Others, especially the later theologians as we have already noted, expressed themselves less fearlessly and preferred rather to be satisfied with the general judgment that there is a seed for the Lord among the seed of believers, for whom the covenantal promises hold without limitation. Heidegger serves as an example: "Not to all the children of believers particularly, but only to the elect baptism seals regeneration and the total contents of spiritual grace. Though it is good and proper to hope for the best for each one in particular according to the judgment of love, it is not permitted in regard to all collectively" (Heppe, Dogmatik der evangelisch-reformierten Kirche, p. 496). Another point of difference concerns the time when the promises of the covenant are usually realized by regeneration in the children of the covenant. Three schools of thought can be identified: the first school (including Ursinus, Polanus, Junius, Walaeus, Cloppenburg, Voetius, and Witsius) not only assumes that the children of the covenant who die before they reach the age of discretion, possess the Holy Spirit from their earliest childhood and so are born again and united to Christ, but also maintains this thesis as generally valid for the seed of the promise without distinction. They use it as an argument in defense of infant baptism in their polemics with the Anabaptists. Ursinus says: "This is sure and certain, that God instituted his sacraments and covenant seals only for those who recognize and maintain the church as already made up of parties of the covenant, and that it is not His intention to make them Christians by the sacraments first, but rather to make those who are already Christians to be Christians more and more and to confirm the work begun in them. . . . Hence, if anyone considers the children of Christians to be pagans and non-Christians, and damns all those infants who cannot come to be baptized, let him take care on what ground he does so, because Paul calls them holy (1 Cor. 7), and God says to all believers in the person of Abraham that He will be their God and the God of their seed. . . . Next let him consider how he will permit them to be baptized with a good conscience, for knowingly to baptize a pagan and unbeliever is an open abuse and desecration of baptism. Our continual answer to the Anabaptists, when they appeal to the lack of faith in infants against infant baptism, is that the Holy Spirit works regeneration and the inclination to faith and obedience to God in them in a manner appropriate to their age, always with it understood that we leave the free mercy and heavenly election unbound and unpenetrated" (quoted in Südhoff, Olevianus und Ursinus, pp. 633f.). And in the Larger Catechism, the question "Are infants, since they have no faith, properly baptized?" is answered: "Yes, faith and the confession of faith are required of adults, since they can in no other way be included into the covenant. For infants it suffices that they are sanctified by the Spirit of Christ in a manner appropriate to their age" (Q. 291). Compare the above quotation of Polanus, which also relates to this issue. Junius argues against the Anabaptists: "We call it false to argue that infants are completely incapable of faith; if they have faith in the principle of the habitus, they have the Spirit of faith. . . . Regeneration is viewed from two aspects, as it is in its foundation, in Christ, in principle, and as it is active in us. The former (which can also be called transplanting from the first to the second Adam) is the root, from which the latter arises as its fruit. By the former elect infants are born again, when they are incorporated into Christ, and its sealing occurs in baptism" (Theses Theologicae, LI, 7). Walaeus writes in his disputation on baptism: "We reject the opinion of the Lutherans who tie the regenerating power of the Holy Spirit to the external water of baptism in such a way that, either it is present in the water itself or at least the principle of regeneration will only work in the administration of baptism. This, however, is opposed to all the places in Scripture, where faith and repentance and hence the beginning and seed of regeneration are antecedently required in the one who is baptized. . . . Therefore, we do not bind the efficacy of baptism to the moment in which the body is sprinkled with external water; but we require with the Scriptures antecedent faith and repentance in the one who is baptized, at least according to the judgment of love, both in the infant children of covenant members, and in adults. For we maintain that in infants too the presence of the seed and the Spirit of faith and conversion is to be ascertained on the basis of divine blessing and the evangelical covenant" (Synopsis Purioris Theologiae, XLIV, 27, 29). Similarly Cloppenburg argues against the Anabaptists: "We posit that the children of believers are incorporated into Christ by the immediate secret work of the Holy Spirit, until, whether in this life or at the moment of death, the period of infancy is completed, so that, whether in the flesh or not, they may confess by faith or sight what God has given them and us together by grace" (Exercitationes, I, 1097). Voetius expresses his agreement with the distinction Burges made between regeneration in principle and active regeneration. He ascribes the former to the elect children of covenant parents, but rejects Burges' position, in which this regeneration in principle follows from baptism as an outworking of the latter. "This is not proven by the Reformed theologians cited by him. It is known that in their opinion the effect of baptism does not lie in the causation of regeneration, but in the sealing of regeneration which has already been brought about." A little earlier he writes, "The seventh opinion is the general point of view of Reformed teachers, in which regeneration is acknowledged in each of the children of the covenant in particular, namely those who are elect, whether they die in infancy or are brought to faith when growing up, etc." (Selectarum Disputationum, II, 410-412). Finally, Witsius writes: "I acknowledge that thus far I agree with this opinion" (Miscellaneorum Sacrorum, II, 634). He also thinks that this view has been accepted in the baptismal formula of the Dutch churches. Besides this school there is still another. Those in this group hesitate to make any stipulation as to the time of regeneration in the children of the promise. Zanchius, Ames, and Fr. Spanheim the elder appear to take this approach. Zanchius, however, thinks of regeneration as given at the time of baptism, rather than occurring long after baptism. He says: "Some infants, as well as some adults, are given the Spirit of faith, by which they are united to Christ, receive the forgiveness of sins and are regenerated, before baptism; this is not the case with others, to whom these gifts are given in baptism" (De Baptismo, III, 31, in Commentarius ad Ephesios, Caput V). Ames states: "We do not deny that God infuses the habitus or principle of grace in some at the time of their baptism; but God can communicate this same grace both before and after baptism" (Bellarminus Enervatus [ed. 1628], III, 68). Spanheim: "Baptism serves regeneration, which precedes in adults and which follows in infants. It takes effect, at times in the present and at other times in the future, according to God's pleasure" (Dubia Evangelica, III, 27, 6). Finally, there is a third school. It held that the preaching of the Word is the usual means by which regeneration takes place as an accompaniment. It held that God does not depart from this rule without necessity, and that in those children who are destined to live to the age of discretion, regeneration bides its time until they can be brought to a conscious possession of the sealed blessings of the covenant. Beza, who was not always consistent on this point, says: "As for the children born in the church, elected by God . . . and who die before coming to the age of discretion, I can easily assume on the basis of the promise of God, that they are united to Christ at birth. However, apart from plain audacity, what can we ascertain concerning the rest other than that they are only regenerated when by hearing they receive the true faith?" (Ad Acta Colloquii Mompelgartensis, p. 106). Another representative of this school was Ussher, who asks as follows: "What must we think of the effect of baptism in those elect infants whom God allows to mature to years of discretion?" He answers: "There is no reason ordinarily to promise them an extraordinary work of God, if God purposes to give them ordinary means. Though God can at times sanctify from the womb, as in the case of Jeremiah and John the Baptist, and at other times in baptism, it is difficult to determine, as some are accustomed to do, that each elect infant ordinarily before or in baptism receives the principle of regeneration and the seed of faith and grace. If, however, such a principle of grace is infused, it cannot be lost or hidden in such a way that it would not demonstrate itself" (Body of Divinity, p. 417). But apart from these two points just discussed, all these schools are agreed in relating infant baptism to the promise of God, given to the church, that from her seed He intends to raise up a seed for Himself. covenant in their system, viz., Calixtus, Wolfgang Jäger of Tübingen, Caspar, Exner, Reuter, and others. when he takes up the latter. locorum communium S.S. de gratuito Dei foedere. life and death? That . . . God has placed me by his infinite and unmerited mercy in his covenant of grace . . covenant." Q. 2: "How do you know that God made such a covenant with you? Because I am a true Christian." belongs to the most important elements of the worship of God demanded by the covenant of grace (Q. 223). covenant of grace with God, i.e., forgiveness of sins, the gift of the Holy Spirit, righteousness, and eternal life"
8 Cartwright's treatise was issued in an unauthorized edition in 1611; 1616 was the first authorized edition. with God, God could have ruled him without any covenantal communion, only by authority of the Law. creating him in His image, as the Lord and Father of spirits." imputation of the active obedience, rather than its denial. of civil righteousness; (2) the law as pedagogue leading to Christ; (3) the law as rule of life for the regenerate). nature of the believer, while the Reformed relate it to the new man, who finds in the law a positive rule of life. commandments. Only under the teaching on gratitude is each commandment dealt with separately. is poised purely as an object before this faith produced by the Holy Spirit."